Embedded in the Kill Chain - Drone Inc. The first set of pilots, the Launch and Recovery Element (LRE), is usually situated a few hundred miles from the target location.225 For Pakistan, they may be positioned in the Kandahar or Jalalabad air base in Afghanistan; for Yemen, in Djibouti or Saudi Arabia. LRE pilots are often contractors from companies like Texas-based Aviation Unmanned, General Atomics, and Merlin Ramco of California.226 Most of them are former Air Force drone pilots, but are paid much higher salaries to work overseas after retirement. The bigger drones, like Northrop Grumman’s Global Hawk, are managed out of Beale Air Force Base in California, as are Lockheed Martin’s piloted U-2 aircraft.230 Other key positions at these U.S.-based sites are the mission intelligence coordinator and safety observer who keep the drones on task and not crashing. 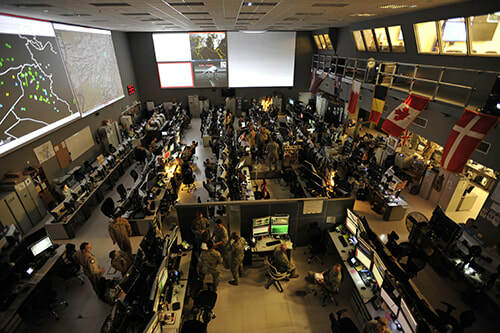 Coordinating the LRE and MCE with ground forces is a Joint Tactical Attack Controller (JTAC) using L-3’s NCCT.244When a JTAC wants to conduct a strike, they are expected to fill out a “9-line” order that specifies target location and possible friendly forces, etc. Most strikes involve weeks of planning, unless they involve rapid response for an urgent situation such as troops under fire.245 In those instances, the JTAC is expected to fill out a DD Form 1972 which is a more complex version of the 9-line.246Contractors do not conduct these targeting tasks. Stories of the psychological trauma suffered by lower-ranked Air Force personnel are emerging, including several video documentaries: Drone by Tonje Schei, National Bird by Sonia Kennebeck and Unmanned by Robert Greenwald.254 Drone personnel—particularly the low-ranked imagery analysts who watch targets day in and day out—testified that the drone war is deeply inaccurate and disturbing.